Our Story - Dinstuhl's Fine Candy Company, Inc. 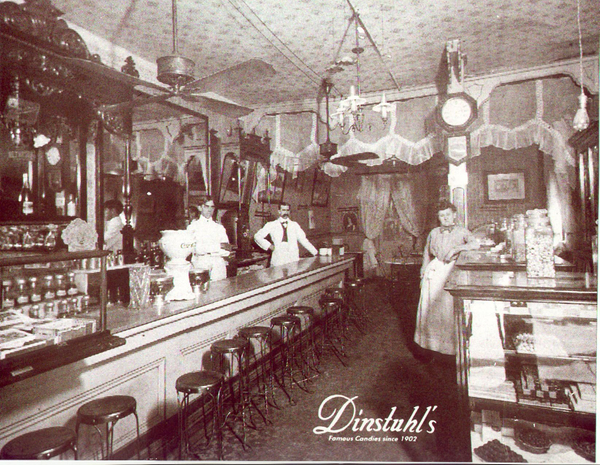 The Dinstuhl Family has been making quality candies in Memphis for five generations beginning with Charles Martin Dinstuhl, Sr. in 1902. In the early 20’s, Charles Martin Dinstuhl, Jr. joined his father as they worked together to provide Memphians with the Finest Candies. One of the signature recipes which have been passed from generation to generation is the famous Chocolate Pecan Fudge. When Charles Martin, Sr. retired, his grandson, Edward Eugene Dinstuhl, then a young teen began learning the recipes. He joined his father to help continue the business during WWII. Several years later, Gene received personal instruction from two prominent New York Candy Makers. It was at this time he added new and exciting recipes to his grandfather’s collection including Cashew Crunch and Chocolate Covered Strawberries. These two recipes created a new era of tradition for the company. In 1970, the young fourth generation Gary Eugene joined his father and grandfather in perfecting the art of Candy Making. During the late 1970’s, Charles Martin, Jr. retired leaving Gene and Gary to lead the company into a tremendous time of growth. Dinstuhl’s has moved from its meager beginning in a 400 square foot shop to the existing 11,000 square foot candy kitchen. With this expanded manufacturing facility, Dinstuhl’s has been able to meet the higher demand for their candies while still maintaining the traditional high quality. In 2003, the Moss family of Memphis bought the historic company to assure that the quality and traditions will be enjoyed for many generations to come. Today, Rebecca Dinstuhl is at the helm and is focused on maintaining the quality that has made us successful for over 100 years, and also plans to expand the market place beyond Memphis with selected items on regional and national levels. Andrew Dinstuhl, a 5th generation candy maker, is in the kitchen creating our delicious recipes, while Marissa Moss manages our Operations making Dinstuhl’s truly a family business. Dinstuhl’s prides itself on using fresh ingredients such as butter, cream, brown sugar, and rich chocolate. Each unique formula is blended in small batches by hand just as it was in 1902. Our commitment to quality is further demonstrated in the kosher certification by the Vaad Hakehilloth of Memphis. Dinstuhl’s has been called upon for many years to make custom products for special events and celebrities such as Elvis, Super Bowl XL, the Kentucky Derby, the NBA Finals and the Breeder’s Cup as well as Graceland and QVC. The ranking of “Best Candy Store in the South” as well as the “#1 Fudge in America” reflects that this “sweet taste of the South” is appreciated by many.